When Jules is actually home by 6pm, I like to take advantage of our evening time together, even if it means we’re going to just walk around our neighborhood. On one particularly sunny afternoon, we walked from our place down to the Marina and passed by a bright red awning that I don’t remember seeing before. We sat down fully intending to just enjoy the beautiful weather with two glasses of wine and a charcuterie plate. What happened was 3 hours of gastronomical bliss, and a love affair with this little bistro on Chestnut Street. 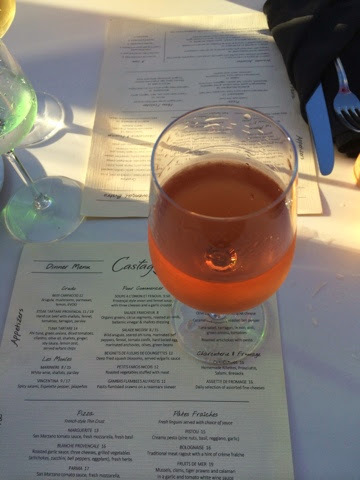 Castagna specializes in Provençal-style cuisine. If you know about the food that comes out of Southern France, it should be no surprise that the menu at Castagna is all about showcasing really fresh ingredients. 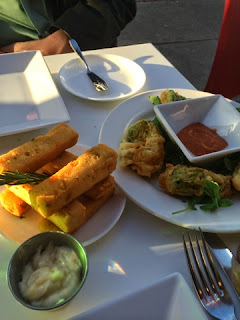 When Jules saw panisse on the menu, he insisted that we order them and I think this was literally one of the best decisions he’s ever made at a dinner. Panisse are fries made of chickpeas, and when they are done correctly, they are perfectly crisp on the outside and light and fluffy on the inside. I would gladly subsist on an entire dinner of these alone. 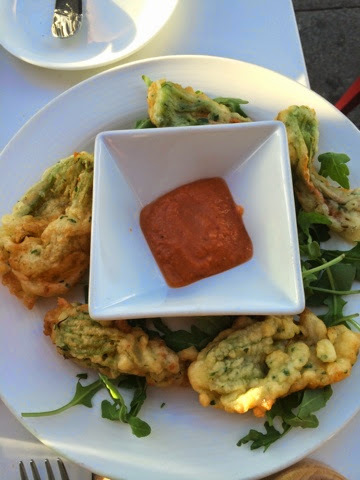 We also ordered the fried zucchini blossoms and the tuna tartare. 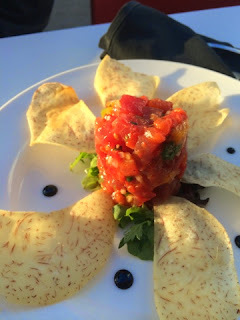 Tuna tartare seems like it’s everywhere these days, but Castagna does it differently; instead of the usual Asian-style, sesame oil-drenched presentation, they keep it light and fresh with tomatoes, soy, ginger, cilantro, shallots, and olive oil, served with a side of taro chips. 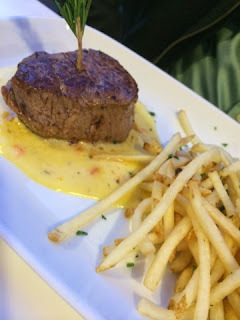 My husband ordered the steak frites, and asked for it “bleu” (which means practically raw), and it arrived perfectly seared on the outside and red – not bloody – in the middle. I had the moules mariniere, which was outstanding. 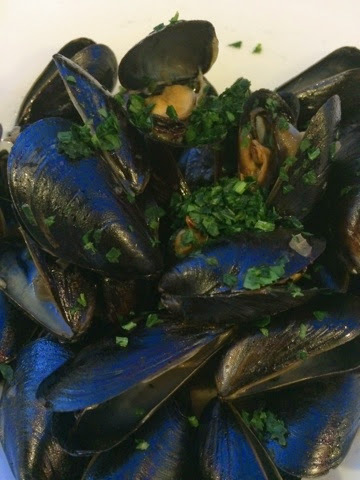 I make a pretty great version at home, but this one just had a little something extra that basically makes my home-cooked mussels look amateurish at best. Our dessert was the warm apple crisp – wonderful flavors, not too sweet. As they are a bistro and wine bar, their by-the-glass wine offerings are really nice – I had a class of Sancerre (one of my favorite whites) and also a glass of rosé (a must have at a Provençal restaurant), and my husband had a beautiful viognier and Côteaux d’Aix en Provence (regional red). We also found out that Castagna had just reopened a week before our visit, after being closed due to a devastating fire for over a year. 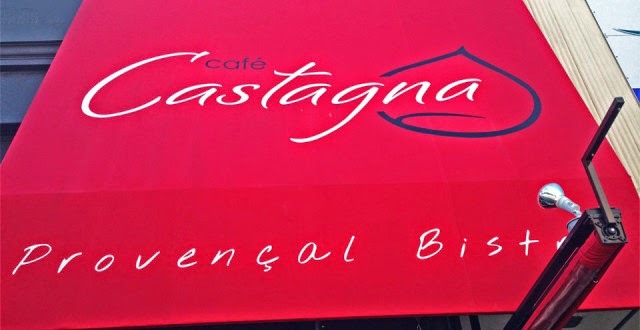 What I hadn’t realized when we walked in was that the owners of Castagna (Jerome & Stephane Meloni) were also the owners of another favorite French restaurant of mine called Cassis, which closed a few years ago! 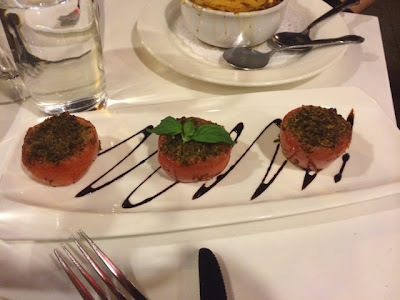 By the end of the meal, it all made sense – the same quality and presentation of food that I’d enjoyed so much at their previous restaurant can be found here too. We plan to be very regular customers at this wonderful place, and we’re so glad they’ve made a glorious comeback!